“Tellus Mater’s themes are earth, ecology, promises, abundance, prosperity and fertility. Her symbols are the globe, soil and grain. The Roman Earth Mother celebrates today’s festivities, the Earth’s Birthday, by sharing of Her abundance, being a Goddess of vegetation, reproduction, and increase. In regional stories, Tellus Mater gave birth to humans, which is why bodies are returned to the soil at death – so they can be reborn from Her womb anew. According to James Ussher, a seventeenth-century Anglican archbishop, God created the earth on October 26, 4004 B.C.E. While this date is uncertain at best, it gives us a good excuse to honor Tellus Mater and hold a birthday party on Her behalf. Make a special cake for the Earth Mother out of natural fertilizers. Take this to a natural setting (don’t forget the candle). Light the candle and wish for the earth’s renewal, then blow it out, remove the candle, and bury your gift to Tellus Mater in the soil, where it can begin manifesting your good wishes! “In ancient Roman religion and myth, Tellus or Terra Mater (‘Mother Earth’) is a Goddess of the earth. Although Tellus and Terra are hardly distinguishable during the Imperial era, Tellus was the name of the original earth Goddess in the religious practices of the Republic or earlier. The scholar Varro (1st century BCE) lists Tellus as one of the di selecti, the twenty principal gods of Rome, and one of the twelve agricultural deities. She is regularly associated with Ceres in rituals pertaining to the earth and agricultural fertility. Patricia Monaghan tells us: “The Roman ‘Mother Earth’ was honored each April 15 [Fordicidia], when a pregnant cow was sacrificed and its unborn calf burned. The Romans tried to offer appropriate tribute to each divinity and they felt that the earth – pregnant in spring with sprouting plants – would especially appreciate such a sacrifice. Tellus’ constant companion was Ceres, the grain Goddess, and the two of them interested themselves not only in vegetative reproduction but in humanity’s increase as well. Therefore, they were invoked at every marriage that they might bless it with offspring. Tellus too was considered the most worthy Goddess on whom to swear oaths, for the earth, witnessing all doings on Her surface, would see that an oath taker kept his promise. Finally, Tellus, to whom the bodies of the dead were returned as to a womb, was the motherly death Goddess, for unlike Her Greek counterpart Gaia, Tellus was associated with the underworld as well as the earth’s surface” (p. 293 – 294). On a side note, “the identity of the Goddess Nerthus, called Terra Mater, Mother Earth by Tacitus in Germania, has been a topic of much scholarly debate.” Click here to read a fantastic article by William Reaves entitled “Nerthus: Toward an Identification”. Monaghan, Patricia. The New Book of Goddesses and Heroines, “Tellus Mater”. Reaves, William P. “Nerthus: Toward an Identification“. Berger, Pamela C. Goddess Obscured: Transformation of the Grain Protectress from Goddess to Saint. Lipka, Michael. Roman Gods: A Conceptual Approach. “Antheia’s themes are promises, friendship, trust, honor, community, love and relationships. Her symbols are gold colored items, honey and myrrh. Since 800 B.C.E. Antheia has been known as the Greek Goddess of marriage, companionship and good council. These attributes manifested themselves in a triple Goddess figure who flowered, sought a mate and reached perfection. Today we ask Her to bless our rites by flowering within our souls so we too can obtain spiritual perfection. “Antheia was one of the Charites, or Graces, of Greek mythology and ‘was the Goddess of flowers and flowery wreaths worn at festivals and parties.’ Her name is derived from the Ancient Greek word anthos, meaning flower, and She was depicted on vases as an attendant of Aphrodite with other Charites. She was known to the Romans as Anthea. Her center of worship was on the island of Crete. Antheia is also the Greek name of Ancient Sozopolis in modern Bulgaria, and another Antheia was a village which was later adopted into Patras around 1000 BC. Her Cyclopedia, “The Goddess Antheia“. “Inna’s themes are harvest, offering, protection, promises and justice. Her symbols are yams and harvested foods. In Nigeria, Inna ensures an abundant yam harvest for the Yam Festival, as well as good crops for farmers who honor Her. During the summer months, She appears as a protectress who oversees our lands, homes, promises and all matters of justice. Oaths taken in Inna’s name are totally binding. Around the end of June, nearly every group in Nigeria celebrates the New Yam Festival with offerings to the Goddess and a feast of yams. This is a sacred crop here and eating yams today will purify your body and spirit. If you can’t find yams, try sweet potatoes instead, sprinkling them with a little brown sugar to ensure sweet rewards for your diligent efforts. To get the wheels of justice turning a little faster, forego the sugar and eat the potatoes steaming hot (heat represents motivating energy). I could find no information on Inna other than that She is an African Goddess of Justice. I found one Goddess by the name of Aha-Njoku (also called the “Lady of Yams), worshipped by the Igbo people of Nigeria, who oversees the growth and harvesting of yams and the women who care for them. Perhaps a minor local deity or spirit? Or Perhaps somehow related to Goddess Ala? “Mati-Syra-Zemlya’s themes are community, divination, promises, justice, and morality. Her symbols are oil and soil. This Goddess’s name means ‘moist mother’, alluding to Her fertile aspects. She attends today’s festivities to hear oaths and witness legal decisions that may affect the rest of the year. Any promise or sentence made with one hand on the earth, or in Her name, is completely binding. In some areas Her motherly nature is expressed through healing qualities, while in others She has prophetic ability. An appropriate gift for Her is hemp oil. Landsgemeinde is a civic-oriented holiday in Switzerland during which people gather to conduct regional business, including voting, budgets, and tax proposals. It’s a very old custom adorned with lavish clothing, ceremonial swords, and, I suspect, and eavesdropping Goddess (just to keep everyone honest). If you need to tie up some pending business, work on your personal budget, or balance the check book, honor Mati-Syra-Zemlya and draw Her ethical energies to you by getting busy! “Mati Syra Zemla, or Matka, for short, is the Slavic Goddess of the Earth. Her name translates to Moist Mother Earth, and describes Her as a forever fertile, life-giving force. She is not seen in human form but as the Earth itself; although it is believed that at certain times She will take human form. 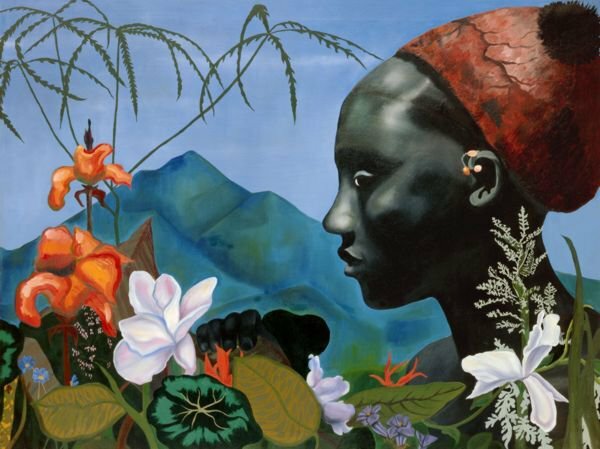 When She does, She is usually portrayed with black skin which associates Her with the blackness of the fertile soil. Matka is believed to be the most ancient and powerful of all of the Eastern European deities. In fact, Matka is so powerful that She survived into the 20th century despite all attempts of the Church to do away with Her. She is the mother of all – the people, the animals, and all of the plants of the Earth. The Slavic people had a strong connection to their Mother Goddess and an altogether different relationship they had with all the other gods. They looked upon Her with a mixture of love and admiration, and She was the only deity they addressed personally. When the peasant people spoke of Her, their eyes would fill with love. They called on Her to witness property disputes and swore by Her name. Oaths and marriages were confirmed by swallowing a clump of earth or holding some on their head while they swear and oath. Her aid was invoked during epidemics and while in childbirth. Matka is also viewed as a champion of justice and a wise prophetess who allows Her petitioners to come to Her without the aide of a priestess or a shaman. It was said that She held all the knowledge of the world and when asked, would release the signs that could be interpreted. I think its important to note that the term “chthonic” is not only used to describe earth deities, but Underworld deities as well. As a chthonic earth Goddess, it would be easy then to see Her as a fertile life giving and nurturing mother – yet on the other hand, Her blackness would be associated with the womb, caves and descending to the Underworld deep within the earth in which we are forced to face fears, past trauma, nightmares and death (metaphorical and physical). It is only within the caverns deep within Her dark womb that we are forced to face and learn to overcome and heal from that which has hurt us, only to re-emerge or be born anew into the world – changed, stronger and wiser. McCannon, John. Encyclopedia Mythica, “Mati Syra Zemlya“. McCannon, John. Encyclopedia Mythica, “Mokos“. MXTODIS123. An Inner Journey: The Moon, Mythology, and You, “Mati Syra Zemlya“. Took, Thalia. A-Muse-ing Grace Gallery, “Melaina“. Axinia. 1000 Petals by Axinia, “Mokosh’ – The Russian Goddess Lakshmi“. Kakasevski, Vesna (translated by Snježana Todorović). Starisloveni.com, “Mokoš“.